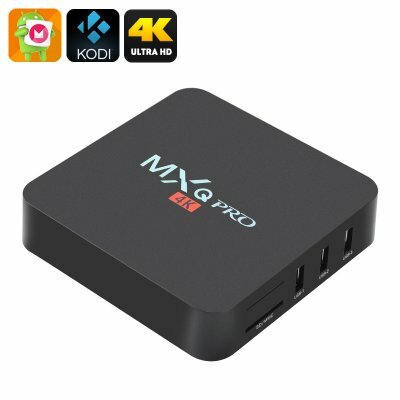 Successfully Added MXQ Pro 4K Ultra HD TV Box - KODI, Android 6.0, 64Bit Amlogic S905 Quad Core, H.265 4K Decoding to your Shopping Cart. The MXQ Pro is from well-known TV box makers MXQ comes equipped with an Amlogic S905 SoC which is the newest standard for TV box excellence, This powerful processors brings UHD 4K support at up to 60FPS and with a wide range of formats supported such including H.265 / 10-bit HEVC and AVS+ codecs you can enjoy superb movies that take up very little space due to advanced compression methods. A highlight of the 2GHz Amlogic S905X Cortex A53 processor is the Penta-Core ARM GPU which take command of all the graphical needs and delivers seamless performance for games movies and everything else you may require with resolutions output at up to 4K (2880x2160). Thanks to the SPDIF port you can even connect to your speakers and play music independently of your TV from radio, from online repositories or your own media library. There's no need to worry about storage space as with the micros SD card slot you can add up to 32GB or storage or use one of the 4 USB ports with a memory pen. With 4 USB ports there is plenty of options for all your peripherals so by adding a mouse and keyboard your all ready for a home computer and entertainment system that will make your TV truly smart. While most TV Boxes support Kodi the MXQ Pro makes your life easier by coming with it preinstalled, with plenty of add-ons already there you just need to plug it, power it up and you can access a world of online media from thousands of channels. This TV box also has a host of preinstalled apps as well as the Google Play store bringing you plenty to choose from. With the smart TV box content to your HDMI TV you can catch up on social media like Facebook and Twitter, download a huge amount of games or surf the web and stream video and music with complete ease. This MXQ Pro Android 6.0 TV box comes with a 12 months warranty, brought to you by the leader in electronic devices as well as wholesale Android TV Boxes.. I've purchased several diiferent tv boxes the MXQ PRO W/ KODI IS SO FAR, MY FAVORITE. Most reliable box Ive purchase and recommend this model if you are looking to stream HD videos.